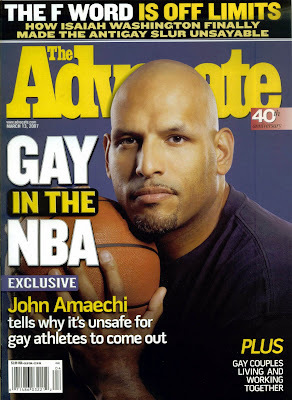 When will team sports see a Openly Gay Male athlete? At the NFL Combine, there was speculation over the sexuality of Notre Dame linebacker Manti Te’o. And his answer, “far from it, farrrrrrrrr from it” on Katie Couric actually didn’t help things. It just reeks of over-compensation. And Te’o is Mormon, which is so strict it’s like…if Christianity is cocaine than Mormonism is crack. This comes off the heels of a recently retired NFL veteran being out after a fight with his boyfriend over soy sauce led to legal charges. So when will we see an openly gay male athlete in one of the four team sports? I think sports may lag the rest of society here, and it could be a long time before we see an openly gay male athlete in the NFL, NBA, MLB or NHL- mostly because of the atmosphere, reputation and language of the locker room. Of course, I regard that as a travesty because if you can integrate lifestyle differences in the military -an even bigger bastion of so called manliness- you can do the same in sports. It is deja vu for Florida Gator fans. Like Billy Donovan, Urban Meyer has left the door open to come back and coach the University of Florida football team. Urban Meyer is reconsidering and will now likely take a leave of absence instead of resigning as Florida’s football coach. Multiple media sources say offensive coordinator Steve Addazio will be interim head coach. First Billy Donovan, now Urban Meyer has unexpectedly stepped down. However, Meyer is not leaving the University of Florida for another job. And his reasons for leaving are far more serious than money offered by the Orlando Magic. Tonight he stunned the college football world with his announcement that he is stepping down as coach due to a non-life threatening heart muscle defect. Meyer resigns while residing at the pinnacle of the college football world, with the Gators going 56-and-10 with two national championships during his five seasons at the Swamp. With the Oakland Raiders finally benching JaMarcus Russell this week (and winning no less right after doing so) it brought me back to the NFL Draft of 2007, when all the experts were so high on the LSU signal caller. Right before the draft, I even extolled Russell’s virtues during my guest appearance on sports talk radio in Milwaukee: Steve “the Homer” True’s show on ESPN radio. You can listen to that clip by clicking this link. It’s right up near the top of the page. And I encourage you to comment below on what panned out and what didn’t from my predictions over two years ago. Because that’s why we love sports talk radio, and internet comment threads- the debate. So if you have feedback on who I have your team taking, you can comment below. By losing in the final seconds to Detroit, Cleveland “won” the #1 Overall Pick Bowl yesterday. (And that bowl game actually sounds more natural and legitimate than the names of many college bowls). The Lions have their QB of the future, Cleveland has Brady Quinn. So that means they desperately need a new quarterback. Although now that news of Clausen’s involvement in a bar fight have emerged, I’m having serious buyer’s remorse in making this pick, and will likely change it next week. With another game remaining against the Saints, the Bucs run defense (or should I say lack thereof) will become ever more apparent and they’ll go for a run-stopper. Suh is an every down defensive tackle due to his dual ability to stuff the run or crash the pocket. He’s an expert at winning his individual battles at the line of scrimmage and often causes disruption in the backfield constantly. He should be taken #1 overall, but unfortunately he’s not a QB. If you don’t know who Eric Berry is, look him up. He could be the heir apparent to Ed Reed as the elite defensive playmaker in the NFL. And if there’s one thing St. Louis needs, it’s defensive plays. And offensive plays, and special teams plays and…. JaMarcus gets benched, and the Raiders respond by upsetting a very good team in the Cincinnati Bengals. Still Bruce Gradkowski is not the solution, so Oakland will again take a signal caller. This cements Russell’s legacy: bigger bust than Jenny McCarthy. The Lions need a lot, they can start on the O Line. The Okung or Williams debate over who is the better choice at offensive tackle is one where there really isn’t a loser. Trent Williams, like Okung, has good feet, strong hands and the talent to become elite in the NFL. This would be a nice complement to Albert Haynesworth, and the Skins could use more talent on the defensive line because the last time they had an overwhelmingly dominant d lineman was something like 40 years ago. McCoy is a pillar of strength that can dominate from the center of the field. He is very agile for a guy just shy of 300 pounds and will be a combine favorite. Greg Hardy may be the purest sack artist in the draft. He has a lethal combination of speed and power that he mixes up to get to the quarterback. Hardy also has a sort of “Overdrive” that he shifts into once he smells a possible sack. Trent Edwards is obviously not the answer, not with that 30th ranked passing attack. After season ending surgery, Bradford’s draft stock was, to paraphrase Snoop Dogg “dropping it like its hot,” but it hasn’t fallen as fast as you might think. His body of work still speaks volumes about what he could do on the next level. Dunlap is one of the biggest reasons Gator opponents have backfield mishaps. He is fast AND strong which will allow him to cause nightmares for opposing tackles for years to come. But because the press is busy kissing Tebow’s a$$ every time the Gators play, he’s a well kept secret. LaFell is a rubber band man when it comes to contorting his body in the air to make the catch. His hands are his biggest asset as he catches the ball softly and away from his body. He needs to improve his route running as he isn’t a super fast runner but as long as he makes catches to bail out his quarterback he’ll be a good NFL player. And don’t let his record as a starter fool you, Kyle Orton is a guy who makes throws that need to be bailed out sometimes. As you might have heard, the Pack’s OL is terrible. Myabe they could get the Bucks’ Brandon Jennings to play OG, people in Wisconsin seem to think he can do anything right now. And if LeBron jokes about playing for the Browns…ok enough fooling around. GB will get a huge boost in their ability to run and pass protect on the left side when they take Bulaga, one of the best OL in college football. Kindle is a versatile linebacker that is an excellent attacker. He takes very good angles to the ball and makes tackles all over the field. Sergio’s mix of energy and instincts allows him to overcome the fact that he is a little slower than coaches would want. Campbell could go higher, because he easily has as much talent and ability as Okung and Williams, but he doesn’t have their track record of durability. Therefore, he slips down the board a little. Best is exactly what is name proclaims at his position. He has very good vision and an even better instinct on when to turn on the jets. He is very good at making defenders miss at every level. He isn’t a bruiser back but if coupled with a versatile offense he has the makings of the next young play-making running back. Cody is a big time anchor guy who could go higher if he stays in good shape throughout the combine and workout process. He is a perfect 3-4 true nose tackle and can really control the flow and direction of a play. The Jags offense works much better when they have two main backs in their stable. And Dwyer, an old school workhorse running back, would be an upgrade over MoJo’s current backups. He can run inside and outside and can handle as many carries as the coach gives him. Dwyer’s a big back, but he has good speed as well and can be the muscle of a two back system or handle the lone number one duties as well. In any other year, Rejus Benn fells out of the first round due to his disappointing 2009 season. But this year’s receiving class is weak and it’s not his fault the quarterbacking in Champaign this fall was a hot mess. Of course, you could probably say the same for the Jets Mark Sanchez. Maybe he’ll look better next year with some complements to Jericho Cotchery. McClain is an amazing tackler in space and can cover a lot of ground from the middle linebacker spot. He’s got great fundamentals and has a knack of shedding blockers to make big tackles. Jones’ is a gap filler and is stronger than Atlas. He is in a Pat Williams type run stopper that will be look like a man amongst boys at times. He plays hard on every play and is of the rare breed of football players that will never quit on any play. The “incident” if you will that Spikes was involved in has sent his draft stock-a-tumbling as all the “character issues” will come into play. Weatherspoon can play both sides of the field (he’ll end up near the ball anyway) and is always around a big play. Whether he’s rushing the passer, busting up a play in the backfield, breaking up a pass or chasing down a receiver from behind, Weatherspoon can do it all. Haden has jumped to the top of the board amongst other corners with solid coverage and ball skills. He makes good reads and adjusts well to the ball when its in the air. And if weren’t for all of the college football media devoting 90% of their coverage to telling us what a model American Tim Tebow is, we’d all be more well aware of these facts. Graham is a big body that plays very well upfield. Scouts will love that he is versatile enough to play the end position in either scheme. Graham himself will love the opportunity to play in a place where defense traditionally comes first and athletes with skill sets usually thrive. Plus, it will be nice to get out of Ann Arbor before all the investigations begin, and players begin to find themselves in sticky situations. Gresham is an elite pass catching tight end. He can run a perfect seam route or he can cover a lot of space over the middle. He needs to work on his blocking but he should be a touchdown machine with his hands, size and route running skills. Spiller’s a fast runner built on a solid frame. His outside running game and ability to catch the ball out of the backfield is where he’ll make his mark, but he’s not afraid to go right at a defender. A little extra muscle and being able to show his durability will help Spiller’s stock go up. Cunningham isn’t as explosive as his teammate Carlos Dunlap but he is more reliable on a play by play basis. He gets to the quarterback with regularity and makes a lot of tackles in the run game as well. Robinson is a super fast coverage man that is above average in nearly every aspect of the game. He anticipates routes but isn’t a huge risk taker and tackles well in the open field. He is also a very good return man. Give how potent their O is, NOLA will obviously draft for D this spring. And Lindley is about to put the finishing touches on what could be the best-ever career by a University of Kentucky defensive back. If you asked a scout to write down their ideal size and speed numbers for an NFL free safety they’d list: 6-3, 235, 4.4. Oddly enough that is Taylor’s height, weight and 40 time on record. Enough said. They have won eight of their last 11 in Houston. They feel more comfortable at the Rockets’ home court than Mark Mangino at an all-you-can-eat pizza buffet. Is the Birdman, and his feel good story a NBA version of Josh Hamilton? Does that mean we’ll soon catch him doing naughty things with strippers? The number one defense in the league at 88 ppg. That will win you a lot of games, especially in an “Association” where so many teams treat the idea of guarding the way Jessica Simpson regards reading books. Their record is all the more impressive when you consider: Marion is out with a sprained left ankle, Dampier sat out his third straight game with an unknown illness and Howard has missed eight games due to offseason left ankle surgery. Antonio McDyess was a nice pickup wasn’t he? They better hope Manu Ginobili can stay healthy, especially with Tony Parker already out. Otherwise the best thing they’ll have going for them is the league’s most attractive fan in Eva Longoria. James Harden has had a couple nice games recently. And you may see them in the playoffs this year. As long you can get past the logo and team name which sounds like a Lingerie football or WNBA franchise. On paper, you really wouldn’t think that some of their pieces go together as a team. Yet they have a winning record. It’s like former Rocket Charles Barkley, whose arrest taught us that donuts and wine coolers go together…or at least they do for him. With Deron Williams back, all is well correct? No, not until they also have Kyle Korver back and finally get their front line healthy and clicking on all cylinders. It seems like ages since Utah had their forward depth at full strength. From Kings’ blog Cowbell Kingdom “Nocioni’s defense has been pretty much spectacular and he’s easily been the best wing defender for the Kings this year.” Always liked Chapu when he played under Scott Skiles in Chicago. The fortunes of this team seem to be mirroring that of Utah, just a couple years behind. I think they’ll finish with a above .500 record, just not much higher. To quote a tweet from Bucksketball.com “I don’t think Acie Law ever wants to see the Bradley Center again.” That was the man “defending” Brandon Jennings the night he dropped 55. Have you seen their attendance figures lately? I wouldn’t be surprised if the Memphis Grizzlies themselves have never even heard of the Memphis Grizzlies. Their only win was over the Nets at home, so that doesn’t actually count right? I think Michigan State might be able to beat the New Jersey Nets’ current lineup. After Ricky Rubio, this franchise is beginning to look cursed. But then again the Arizona Cardinals finally made it to the Super Bowl last year. So don’t give up hope Twin Cities. Historians will call this era the “Golden Age of Point Guards,” and Rajon Rondo is telling everyone with his play: “don’t forget about me.” Fast start for Beantown, conjuring up memories of 2007-08. We know EA Sports cover boy Dwight Howard is pretty much as good as it gets at his position in this league. The bigger question mark is Vinsanity. If Carter is on his A game this season, they could easily be back in the Finals. Off to a hot start, and looking good in what is no doubt one of the league’s toughest divisions. But next year could be the year they really make some noise, as they could make a major splash in free agency. You might have heard a thing or two about some decent FAs becoming available next summer. Record is pretty good considering they’ve shot above 42% in a game just once this season. Derrick Rose is obviously their headliner, but the guy making the leap this so far is Joakim Noah. His version of making the leap isn’t scoring, it’s more defense and rebounding. His numbers on the glass don’t lie; and did you see the way he forced LeBron to his left on the final possession in the big win at Cleveland? That’s getting a stop when it’s absolutely necessary. Of all the teams in the NBA that warrant national publicity, but fail to garner it, this team is likely the most talented. I could have said the “Hawks fly under the radar,” but I thought that it would have been a bit tacky and shopworn. Even with Shaq in the house, they still look way too overly dependent on LeBron. And what’s up with them not getting out and running? They will have more success this season if they quicken the tempo at Quicken Loans Arena, and utilize the King’s athleticism more. They’re a good team, better than the lackluster start they’ve gotten off to. But they should win be in “win now” mode more than any other team, just in case they can’t keep Chris Bosh after this season. The off-season was uninspiring, and having Gerald Wallace as your top gun doesn’t sound very exciting or intimidating on paper, but their depth and balance will surprise you. And they’ll win more games than you think they will. The Phillies and Eagles have had a lot of success in 2009, but don’t expect the Sixers to join in. They have backcourt issues, and the frontcourt isn’t good enough to compensate for those issues. Could this be the year? Well, yes if you’re defining “the year” as the season in which Detroit misses the postseason for the first time in quite a while. They were under .500 yet a #8 seed last year, and all the moves they’ve made since then did nothing to address their problems. They still need a beast down low. More athleticism and higher skill sets from their bigs is crucial. It would help if the forwards could stay healthy more often too. The annual Michael Redd injury came early this year. How will they fill the scoring void? Possibly Brandon Jennings, the early favorite to win Rookie of the Year. Jennings and last year’s ROY, Derrick Rose are on their way to developing a phenomenal Central Division rivalry. The last time the NBA had a team this white, it was the 1950s. Funny that this lily team is located in the “Hoosier” state too. Maybe Larry Bird should hire Gene Hackman and Dennis Hopper to coach them? If team marketing slogans were actually honest, (and in this case brutally honest) you’d have “Knicks basketball: just one more season till our contracts expire!” Seriously, most of that wasted money comes off the books after this year, so hold tight: change you could possibly believe is on its way. I’d use one of 2008’s biggest buzz words, “a hot mess” to describe New Jersey’s roster, but that is truly an insult to hot messes everywhere. Team needs have been taken into account for this mock draft. And of course, this is all highly subject to change between now and late April. Suh is an expert at winning his battle at the line of scrimmage and causes disruption in the backfield constantly. He is an every down defensive tackle due to his dual ability to stuff the run or crash the pocket. Russell Okung is as good a left tackle you will find in all of college football. He has the fundamental base of a franchise tackle to go with his physical skills. Okung also gets praised by pretty much everyone for his intelligence as well. If you don’t know who Eric Berry is, look him up. He could be the heir apparent to Ed Reed as the elite defensive playmaker in the NFL. McCoy is a pillar of strength that can dominate from the center of the field. He is very agile for a guy just shy of 300 pounds and will be a combine favorite. The Okung or Williams debate over who is the better choice at offensive tackle is one where there really isn’t a loser. Trent Williams, like Okung, has good feet, strong hands and the talent to become elite in the NFL. You’ve heard that they were going to draft Tim Tebow, in order to get a badly needed publicity injection to help the ailing ticket sales. But Tebow’s pro potential is not worth a pick this high (or anywhere in the 1st round for that matter). This fact is easy to forget when you consider the ludicrous slurping job the press do for Tebow and the ridiculous amount of of overcoverage he receives. Lost in the hoopla is Tebow’s teammate Spikes who could be a star on the next level. Snead’s stock has solidified as a first rounder but a good run through the SEC could determine if he is picked near the top or bottom. He isn’t elusive by any means but his pocket presence and second nature footwork in the pocket makes him a quarterback with a future in the NFL. He has the ability to throw to any spot on the field but his accuracy fails him when he gets lazy. Brown is a people mover that has the benefit of playing in a pro-style offensive scheme that will make the college-to-NFL transition much easier than some. Bryant’s body of work is more than enough to impress scouts even with his current eligibility issue. His body control and athleticism is something that has NFL coaches very intrigued. He has battled injury issues, but when he’s on the field he is a force. Best is exactly what is name proclaims at his position. He has very good vision and an even better instinct on when to turn on the jets. He is very good at making defenders miss at every level. He isn’t a bruiser back but if coupled with a versatile offense he has the makings of the next young playmaking running back. Falling 16 spots? Yep that’s what season ending surgery will do. But he’s said he’s for sure going on to the next level, so get ready. If heals up properly than he could be a steal. Besides Kyle Orton is still (despite the record) a “game manager” not a franchise QB. Dwyer is an old school workhorse running back. He can run inside and outside and can handle as many carries as the coach gives him. Dwyer’s a big back, but he has good speed as well and can be the muscle of a two back system or handle the lone number one duties as well. LaFell is a rubber band man when it comes to contorting his body in the air to make the catch. His hands are his biggest asset as he catches the ball softly and away from his body. He needs to improve his route running as he isn’t a super fast runner but as long as he makes catches to bail out his quarterback he’ll be a good NFL player. Graham is a big body that plays very well upfield. Scouts will love that he is versatile enough to play the end position in either scheme. The Pats LB corp certainly got hold, seemingly overnight, didn’t they? The same thing might happen with their DL soon. Especially with Adalius Thomas seemingly wearing out his welcome. To cite the film Wedding Crashers: “Crab cakes and football, that’s what Maryland DOES!” And the Ravens will help bring the D.C. area native home once he formally decides to skip his senior season. And why would he not? with the clusterf@%k going on in Champaign, the Illini coaching staff has ruined his draft stock enough already for him to stick around another year. Locker’s draft stock has shot up with his solid play this season for the Huskies. I expect things will come down by draft time but he’s raised enough eyebrows to maintain his status as a potential number one pick. A big reason why Iowa is so good, yet so BORING to watch, is that their best talent is at the OL. And Bulaga is big reason that the Hawkeyes are winning ugly this season. Well, actually winning hideously.